In June, I’ll have been living in my flat for 6 years! Which is be the longest time I’ve spent in one place since I was a kid. We were in North End Road for nearly 17 years, I think, before Ma, Ben and I moved out when I was 20. When I moved in, I knew that it would take a while to get it exactly as I wanted it, mostly because I was moving into a completely unfurnished space, with furniture that came from lots of different places. I took the view I would live with as it was, decide what I really needed and then eventually get what I really wanted. I wanted to get things that worked, that would last, investment furniture. Not necessarily the most expensive furniture but things that suited me, the flat and how I lived. No-where was that more clear than in the issue of the kitchen chairs. When I moved into the flat, I had 3 Ikea folding chairs and a directors chair. Eventually after much thought, I pulled the trigger and bought two new kitchen chairs. 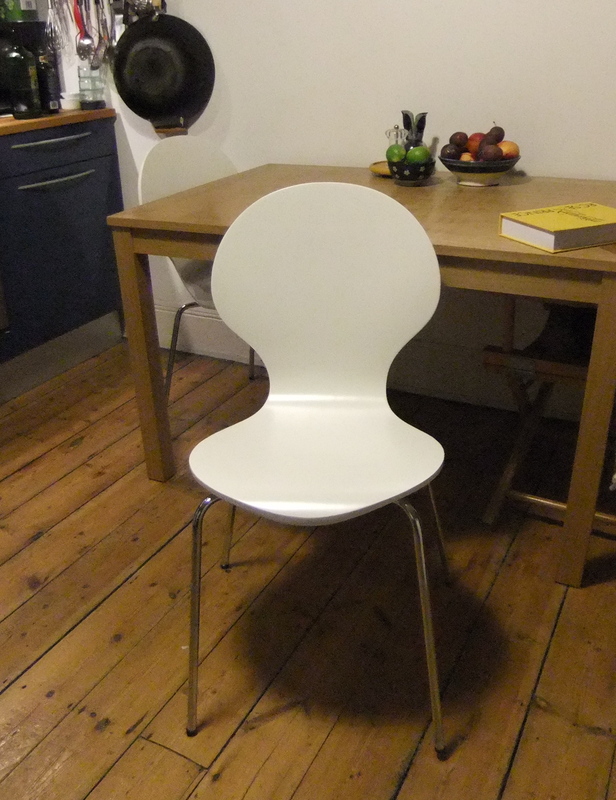 I was planning on buying more and eventually, I would have lovely, comfortable kitchen chairs, done and done. It didn’t work out quite like that. They were very rubbish and the legs were a bit bendy and dangerous – one of them, collapsing when I was sitting on it, with a small child on my lap. We were unharmed but clearly they were not the solution I’d hoped for. Kitchen chairs are expensive so I soldiered on with what I had. Then Ma moved out of her flat and I inherited two more chairs. Another directors chair and a proper old fashioned kitchen chair. My chair. in fact. 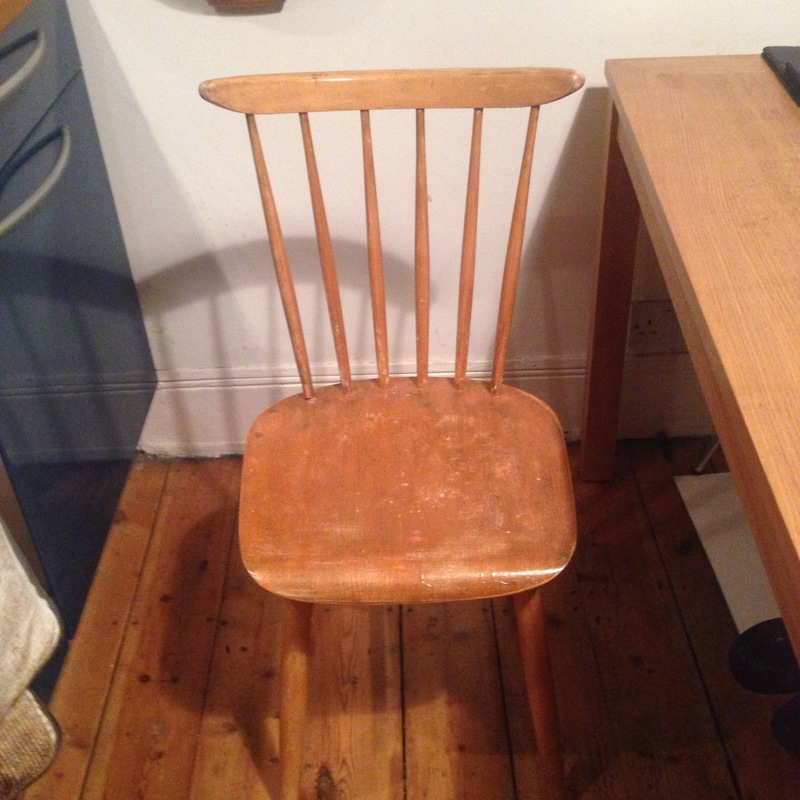 It was one of our dining room chairs, painted brown and later, I took off all the paint and varnished it (not a great job but I was a teenager! ), it was my desk chair. The amount of bad essays and angst written while I was sitting in that chair is best forgotten! Now it’s mine again. I think the perfect solution my kitchen chair issue, may never exist. I think a mishmash of chairs may be the way it plays out and it probably suits my ‘no decoration’ style of interior decoration. Having said that, all three of my kitchen chairs are comfortable and sturdy so provided that I don’t have more than two people over to dinner at a time, it’s fine! This entry was posted in Home, How I Live and tagged decoration, furniture, kitchen chairs. Bookmark the permalink.